How To Change Guitar Strings - Guitar For Beginners Lessons. Free Guitar For Beginners Lessons! In this free guitar for beginners lesson you will learn how to change guitar strings. You will know your guitar strings need to be replaced when they get dirty and it affects your playing. The frequency that you need to change your guitar strings depens on how much you play. A good rule of thumb is every 6 months. First remove the old string and then insert the new string into the bridge and through the tuning peg as shown. Next bend the string the string around the tuning peg. Insert the new string through the posthole. 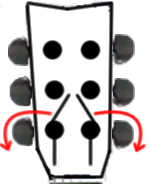 On the left side bend the string around the tuning peg clockwise. On the right side bend the string around the tuning peg counter clockwise. Finally hold the new string tightly and begin winding the tuning peg. Leave enough slack on the new string to wrap the string around the tuning peg 3-4 times to make sure that it stays in place.Then cut off any extra string that is left over. Last, tune your guitar to the correct pitch using the Guitar Tuner and learn to play the guitar!